Fig. 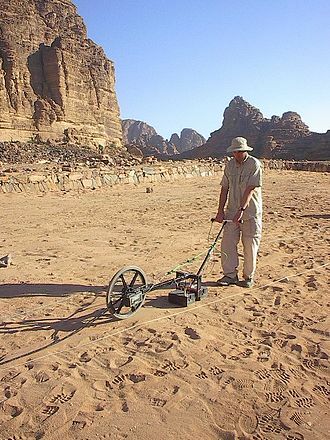 84 Archaeological GPR survey in Jordan. Image source . Fig. 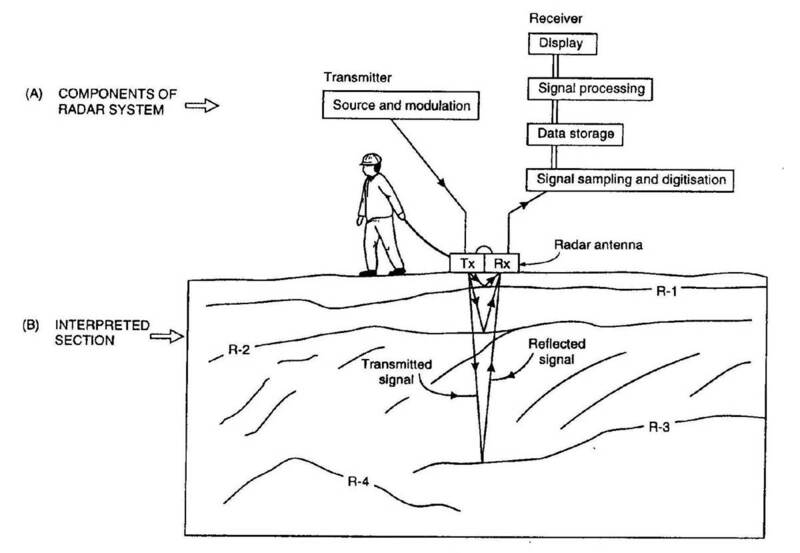 85 Schematic of a zero-offset GPR setup. During GPR surveys, a source (\(Tx\)) is used to send a pulse of high-frequency electromagnetic waves (radiowaves) into the ground. As the radiowaves propagate through the Earth, they are distorted as a result of the Earth’s electromagnetic properties. At boundaries where the subsurface electromagnetic properties change abruptly, radiowave signals may undergo transmission, reflection and/or refraction. 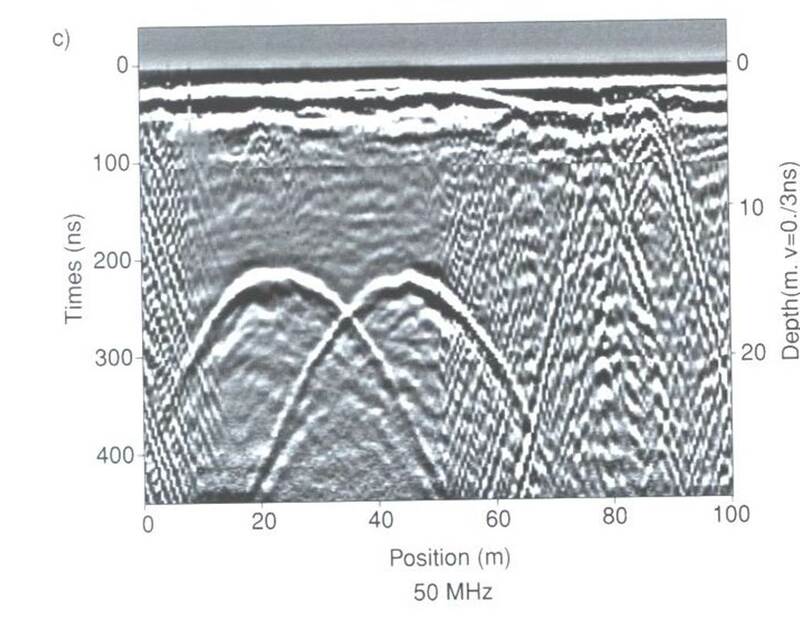 Because of this, much of the understanding of seismic methods can be applied to ground penetrating radar. Fig. 86 Radargram example of two underground tunnels (hyperbolas). Gray-scale shows the amplitude of the returning signal. Sensors (\(Rx\)) at the Earth’s surface measure the amplitudes and travel times of signals returning to the surface. These data from each trace (Tx-Rx pair) are amalgamated and represented using a radargram (similar to a seismogram). The horizontal axis (distance) is used to represent the location of the receiver relative to the source for a particular sounding. The vertical axis shows the travel times of measured signal. By assuming some a-priori knowledge of the radiowave velocity, the vertical axis is sometimes represented by an approximate travel distance. The gray-scale denotes the amplitude of the returning signal at each time and location. It is from radargrams that we will do the majority of our interpretation of GPR data.